ANOMALY is please to announce our upcoming exhibition, “Waste Land,” both as the title and the key word that will introduce nine artists collaborating with ANOMALY and their works. The exhibition will commence on March 9 through April 6, 2019. The Heisei era (1989 – 2019) coinciding with the reign of Emperor Akihito will end with his abdication this spring, to be immediately followed by an era with a new name. Looking back on it, Heisei was a period of advances on many fronts driven by technical and media innovation, as well as disquieting phenomena as regards both society and climate. And now, it is drawing to a close. The Heisei era saw qualitative changes in society as exemplified by the introduction of the consumption tax, nerve gas attacks in the Tokyo subway system by the Aum Shinrikyo cult, and the Livedoor affair. It also saw the explosive spread of personal computers following the launch of Windows 95 and the diffusion of mobile devices and social network services triggered by technical advances in the form of the Internet and the appearance of the iPhone. These developments remade communication and the formation of public opinion. Heisei was at the same time an age that changed relations between the individual and society, as typified by a focus on self-responsibility, which, properly speaking, cannot be bartered for freedom, and the rise of self-censorship due to apprehensions about anonymous pressure. Meanwhile, the relatively frequent occurrence of natural disasters, and especially the Great Hanshin Earthquake and the Great East Japan Earthquake, has presumably put an end to belief in “solid ground” that had gradually come to prevail after the Great Kanto Earthquake of 1923. The Fukushima Daiichi nuclear power plant catastrophe swayed the direction of national policy on energy supply that had continued basically unchanged since the Showa era. The issue also divided public opinion, and controversy over it continues today. The world scene is colored by underlying fear of terrorism, tighter restrictions on immigration through reinforcement of the nation-state framework, inter-ethnic and -racial strife, ideological drifts to the right, and a worldwide upsurge in the feminism and LGBTQ movements. The picture is a tangle of changes in national outlooks, recognition of the individual, yearnings for freedom, and diverse regulations directed against these trends, all mixed into the maelstrom brewed by ruthless ultra-capitalism. 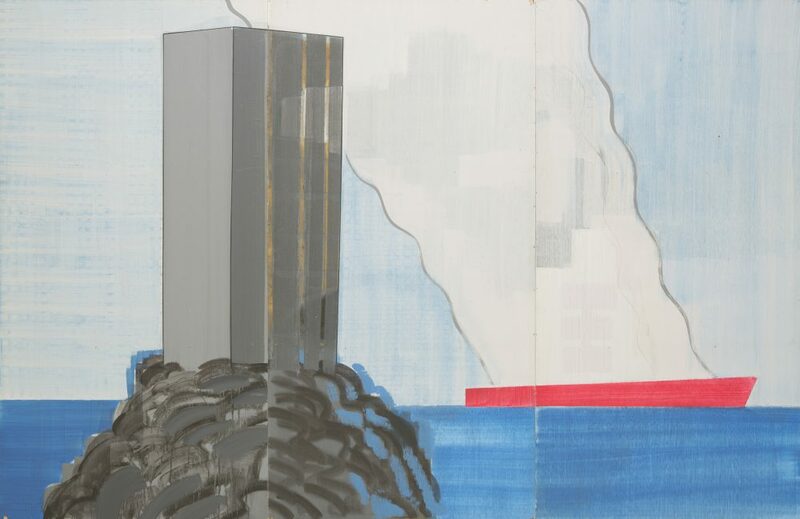 With an awareness of this “l’air du temps,” the exhibition is an attempt to render slices of the waste land atmosphere visible, through the works of artists who navigated the Heisei era and were touched by it. The title “Waste Land” of course reflects “The Waste Land,” T.S. Eliot’s milestone poem. With a five-part structure, the poem is known for its avant-garde sketch of confusion and devastation in the West after the First World War. The identity of the speaker changes in the course of it, and the poetic style is a break with the contemporary convention. The air of the times conjured up by its grand, multilayered composition and recondite verses makes readers feel a sense of desolation but also the possibility of liberation from the same. These considerations prompted the decision to take the title of the exhibition from it. Yuichi Yokoyama (b. 1967), an artist who is also acclaimed as a cartoonist, will be represented at the exhibition by panel painting produced by an original procedure. Excluding all narrative, the works are both artificial and look to the not-so-distant future. While depicting incidents in society, they afford a variegated view of the temper of the times owing to the depth of their coloring, in spite of being painted in a pop style on flat surfaces. For this exhibition, Takahiro Iwasaki (b. 1975) will be introduced through an elaborate new work that was recently displayed at Ginza Six, a sleek new commercial complex in Tokyo’s Ginza district. It depicts transmission lines meticulously fashioned from threads pulled out of fabric and a dark landscape that brings to mind an active seismic fault. It is an image of the pulse of energy supply and an everyday scene that could be found throughout Japan today. Chu Enoki (b. 1944) is scheduled to exhibit a work consisting of weaponry, specifically, guns used for a performance in which he transformed the streets of Kobe into an urban theater and led an armed band in marching down them. Held early in the Heisei era, this guerrilla performance now has the status of a legendary happening in light of the subsequent onset of excessive fear of terrorism and the contraction of social tolerance. Tadasu Takamine (b. 1968) is slated to exhibit a series of photos taking all sorts of human struggles as its theme. Takamine built his career as a member of Dumb Type, and uses his own body to shed critical light on latent oppression by social systems and collective/group consciousness. Utilizing iron as her medium, Noe Aoki (b. 1958) demolished the equation of sculpture with masses of material in the 1980s and remained highly active in the Showa and Heisei eras. The exhibit will show one of her signature works combining a base that looks fragile and rickety although it is made of iron with stacked bars of soap that have passed through the hands of many people. Its appearance and the many-colored bars of soap, which have a human-like individuality, go beyond beauty and are likewise suggestive of the body as material. Nile Koetting (b. 1989) is an artist whose explorations probe sexuality in the broadest sense of the term within the context of the social system, and even extend to the relationship between body and matter. With his intellectual play, he has taken a big leap beyond conventional theories of corporeality. Looking askance at the limits of social permissibility, his video installation conveys the continued ballooning of human sensation that is accompanying advances in technology. Tiger Tateishi (1941 – 1998) is known as the artist who brought cartoon panel layouts into paintings. The exhibition will introduce flat artwork that incorporates the dimension of time by application of cartoon techniques and turns the whole world on its head. All such issues are addressed by Ushio Shinohara (b. 1932), a giant of avant-garde art, best known for his contribution to the exhibition “Japanese Summer 1960-64 – I Don’t Give a Damn Anymore!” His “boxing paintings” have an overwhelming destructive power that easily eclipses the times and knocks out all cogitation. With a nonchalant guilelessness of the sort that used to characterize Japanese art, his work positively blows away the haze in contemporary skies. We look forward to welcoming you at the exhibition. Copyright © ANOMALY, All rights reserved.